When you are looking for the ultimate in a pressure chemical sprayer, pressure washers accessories, extension wands, hoses or nozzles, there are vast product selections and brands at your disposal. From handheld, back and spot sprayers, to an advanced professional service chemical sprayer for residential and commercial purposes, we carry and offer them all. No matter how large or small your tasks and projects at hand, a quality, highly functional, specifically designed pressurized chemical sprayer can make your job go faster, easier and cheaper in most cases. Having the right tool and process for any job, just makes it go more smoothly. All types of chemical sprayer, whether top-grade plastic or metal, are available in a wide range of sizes. They are versatile and some backpack or strap-on, even carrier-types have a pump handle for you to regulate pressure and ensure even flow. Always store your equipment in a safe way. Preferably in the cap-off position, away from light and heat. Always add the chemicals to the water in the sprayer and not the other way around. Top it up with more water if required. Checking hoses and all moving parts of the chemical sprayer is wise to ensure its conditioning and optimal functioning for years to come. Clean, rinse and spray clean over the ground, not in the sink. Close the chemical sprayer, by carefully and snugly screwing the top or cap on. Ensure that no pressure will escape from the chemical sprayer to give you maximum power and efficiency. Ensure that you empty the whole tank of the sprayer and not leave any chemical residue behind. Rinse it thoroughly with water before storing your equipment. Ensure that you test and fill up the sprayer every time PRIOR to use with clear and clean water. Check its operation and pressure, monitor and test its function and effectiveness, as well as no clogging or obstruction in the nozzles for example. Ensure you measure and mix the chemicals correctly, according to the instructions and operation manuals provided with the products and chemical sprayer itself. It is unwise to ever carry a sprayer by its hose. The correct way is to always use the handle. Larger sprayers can cover more areas, but can get really heavy to lug around if strapped to your back, rather stop and refill often, than putting too much strain on your backside and legs. Spray gently and evenly, to cover the whole area of your project, regardless of size or scope. Refill as necessary. Squeeze the handle gently to start applying pressure. Unused chemicals should also be stored safely. Safely dispose of chemicals from your equipment, watching for your eyes, skin, area surfaces and considering the impact on the environment, wildlife and water-sources close by. Handheld sprayers are quite popular in a variety of sizes, ranging from 1.2L (0.3 gallons) to 6.5 L (1.7 gallons) and even 2 gallon sprayers are available. These specialist sprayers for chemical applications also come offering various pressure 10PSI - 55 PSI. The higher the pressure, the bigger the bang for your buck and more expensive the equipment tends to get as well. A back-pack with harness configuration and adjustable pressure, offer you more versatility and different nozzles, for a wide variety of choice jobs in and around your house, property and garden. 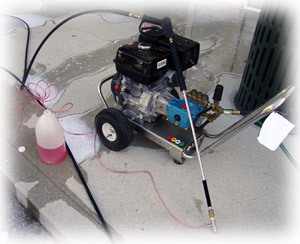 Pressure guns, extension wands and hoses can all make your equipment even more effective and useful. Herbicide, garden or cleaning, these types of equipment have lots of uses and applications. It enables you to move around and get the products where they need to go to be most effective, quickly and effectively, covering all ground(s) with relative ease. Cleaning and maintenance of this equipment is quite easy as well and part of the reason they are getting to be a must have for every proud home and/or business owner!